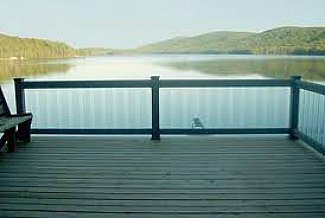 Why Use a Glass Deck Railing? Do you have a spectacular view from your deck? Do you live on a lake or near a beautiful mountain vista? 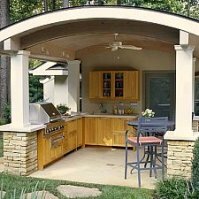 Maybe you have done a spectacular job of designing your backyard and you simply don't want anything to block your view of it. So what do you do when you are required to have railing on your deck? That is the perfect application for this unique style of deck railing. Let's get the bad news out of the way first. Glass deck railing is expensive. Some might say very expensive. So it really isn't usually the best bet except in areas where the view is so good that the investment is worth it. Of course, if money is no object for you - good for you! And you make me sick. For the rest of us, consider using a combination of glass and some other railing design. There's is no need to spend the money for glass railing around your entire deck if only one or two sections need it. Blend the glass sections into another style so that a consistent design is present, while positioning the glass sections to maximize the view. The combination of wood and glass below is a beautiful example. Regardless of the material you use for your deck railing frame, if you plan on using glass you will need to be sure the frame will support the extra weight. The glass used for railings is usually 3/8 of an inch thick. When you put that glass in a solid panel that may be five feet long and nearly three feet tall, you will have a lot more weight than nearly any other railing style. You may be able to use 1/4 in glass, just be sure to check the code in your area. The thinner glass is much lighter and much less expensive if it fits for your application. So be sure that your frame is strong enough to support the glass. 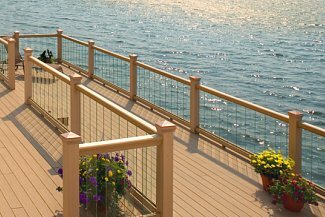 If you are designing the railing system from scratch try to keep the section lengths to five feet of less. If you are having to deal with an existing rail system you may need to add additional support under the bottom rail of any sections longer than five feet. 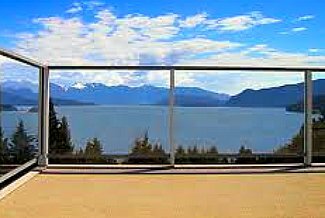 One way to reduce the weight of a glass deck railing system is to use multiple vertical strips of glass with open space in between them. The open space will have to comply with the same code requirements any other material would - usually about four inches. 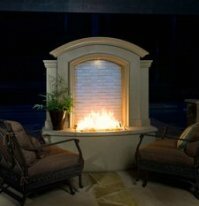 This style is lighter and less expensive - after all, the air space between the panels is free! You will also have air flow between the panels. With solid glass panels, the air flow is greatly reduced, sometimes nearly eliminated. So if you enjoy a nice breeze while relaxing on your deck, keep that in mind. 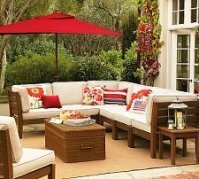 On the other hand, if you live in a cold climate you may be able to enjoy your deck more often if you are shielded from the wind. Just be aware that it is a factor. 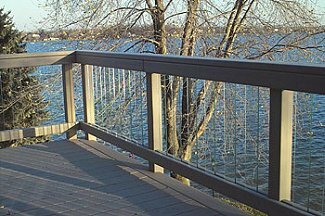 There are some very nice aluminum and glass deck railing systems available. While the glass is very heavy, the aluminum is very light - so there is some offset there. The aluminum framing is available in a variety of colors, and the design makes it simple to blend glass sections with more traditional aluminum sections. 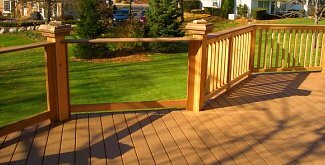 This combination makes a very attractive and durable deck railing system. And even better, it's low maintenance as well! The glass itself can also be colored. A light tint is often the best option, especially for kids and animals. While it will still be clear, you can still see that it is there. Tinting may help with the brightness and glare from water or snow, so if that is in your plan, think about tinting. A wooden frame will work just fine as well. Just be sure your builder (or you) plan for the extra weight and that you allow room inside the frame for the glass to move just a bit. If the frame is too rigid the stress can transfer to the glass, which is not good. Rubber spacers help cushion the glass as well. A glass deck railing system is just as safe as any other style. In fact, solid glass panels may be safer in one regard. They eliminate the spaces where little arms or legs can go through. But you will need to keep in mind that you are still dealing with glass. You can't treat it like wood or metal. The glass used for this purpose is tempered for safety and the edges should be ground to eliminate sharp edges. Even if the edges are not exposed they should be ground for safety during installation. Regardless of the safety precautions, glass is still glass and it can break. So care should be taken to reduce that likelihood. If some in your household may be practicing with their slingshots off the deck - glass may not be for you. I have two sons and I do not have glass deck railings. 'Nuff said. But seriously, if there is likely to be rambunctious activity on your deck - consider that carefully. Nomal use should not result in any problem with breakage whatsoever. Maintenance is a mixed bag with glass deck railing. There will likely be a little more regular care required since the glass will need to be cleaned periodically. The frequency of cleaning varies with local conditions, but when you clean the exterior of your windows, the deck glass will need it as well. The upside is that you will never need to pressure wash the glass, you will never need to sand it, and you will never need to stain it.